Has the country of his birth reduced the memory of Mahatma Gandhi to mere tokenism ï¿½ something to be ritually observed on the 2nd of October (Gandhi Jayanti) and forgotten the rest of the year? This certainly seems to be the case in the state of Gandhiï¿½s birth, Gujarat, which is now facing the danger of turning into Modiï¿½s Gujarat, accompanied by the propaganda that befits a rabble-rouser like him. The Times of India has reported on the contents of the new social studies textbooks that have been prepared by the Gujarat State Board of School Text Books. These books, now in circulation, find fault with the freedom movement to the extent that a Class VIII student is taught the negative aspects of Gandhijiï¿½s non-cooperation movement ï¿½ a movement that gained fame across the world and provided inspiration to many, like Dr. Martin Luther King and Nelson Mandela, and gave India a special status in the world. The new stars in the Gujarat firmament are Fascism and Nazism with Hitler, its founder, being given pride of place in school textbooks. Fascism and Nazism, with their stress on national pride and the supremacy of the German race, are described in glowing terms, while the pogroms against the Jews and other weaker sections of the people have hardly been touched upon. There has been a lot of writing, rewriting and re-rewriting of history in India since the past few years, but nothing as shocking as Hitler being glorified and Gandhiji being put down in his home state. The irony is that when the Jews and European nations felt threatened by Nazism, it was the Mahatma who advised Winston Churchill and the other leaders to adopt non-violent means. Gandhi was the antithesis of Hitler in every way, but most so when it came to the matter of non-violence. He took the concept of ahimsa from Hindu, Buddhist and Jain traditions and fashioned it into a weapon, but not one of mass destruction. Gandhi claimed that Muslim and Sikh traditions revealed a place for non-violence and also saw its consonance with Christianity. Gandhi argued that it was a delusion and a folly to wage a war like the Mahabharata, which ended with only a handful of survivors. He felt that ahimsa was integral to Hinduism and the Indian soil, and was not a sign of weakness for it was more a devilish will than physical strength that made it possible for a person to press a trigger to shoot another. Gandhi used ahimsa effectively to wage a non-violent war; in the form of satyagrahas against the South African and British governments, protests against caste and religious divisions and when the need arose, as a means to actively speak on behalf of the weak, the maimed, the suppressed and sick, by displaying unconditional love for these factions. It is more than half a century since Gandhiï¿½s death, and his beloved country seems to be moving further and further away from his ideals. Thanks to a virulent brand of Hindutva, the country is being increasingly divided across religious lines. When self-appointed upholders of the majority religion display fissiparous tendencies, it has its impact on the minority religions whose leaders feel that they have to jump into the bandwagon of preaching differences. So, one sees the likes of what happened in Godhra followed by the retaliatory carnage in Gujarat, courtesy the Modi brand of Hindutva. 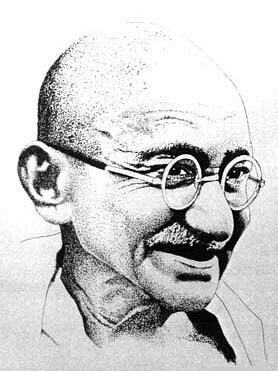 Gandhi believed that violence would beget more of itself, as much as love would beget more love. His words are prophetic not only with regard to what is happening in India but also across the world, with Iraq being the most glaring example. Gandhiï¿½s advice to leaders was to think of the last man down the line when taking any decision. Present-day leaders have moved far away from Gandhian ideals, as their decisions seem to benefit only the rich and the powerful while in 21st century India, there are still people dying from hunger and poverty; often resorting to suicide to be freed from their living hells. So instead of the ritualistic offerings of floral and verbal tributes on Gandhi Jayanti and the customary screening of Richard Attenboroughï¿½s celluloid tribute to Gandhi on the national channel, our leaders would be well advised to applying the ideals of a saint of whom Albert Einstein said: Generations to come, it may be, will scarce believe that such a one as this, ever in flesh and blood, walked upon this earth.